The intent of the proxy-pattern is to provide a placeholder for another object to control access to it. It introduces an additional level of indirection. There are several reasons why you would want to do this, hence there are several uses for this pattern. So we could think about loading each picture on demand, which occurs when an image becomes visible in the document. But what do we put in the document instead of the image? And how can we hide that the pictures are created on demand? The solution is to use another object, a proxy, in place of an image. The proxy acts like an image and loads the picture when it's required. The proxy loads and creates the real image just when the document editor requests for showing that image by invoking its draw-method. The proxy then loads the image and forwards the request to it. A remote proxy is responsible for encoding a request and its arguments and for sending (and retrieving) the request (and the response) to the real object. A virtual proxy may cache additional information about the real subject so that it can postpone the access to it. A protection proxy checks whether the caller has sufficient access permissions for perform a request. In many cases, real world proxies are a combination of some of these basic proxies. The proxy pattern is applicable whenever there is a need for a more versatile or sophisticated reference to an object than just a simple pointer. Usually proxies use some form of the facade pattern to supply a unified interface. It is similar to the decorator pattern which might be a more specific case of the use of a proxy. In this short example we will use a virtual proxy to handle images. And now at last, we create the proxy class. The ImageProxy object will maintain references to the real Image object. The interfaces of Image and ImageProxy are identical, however their implementations are of course different. 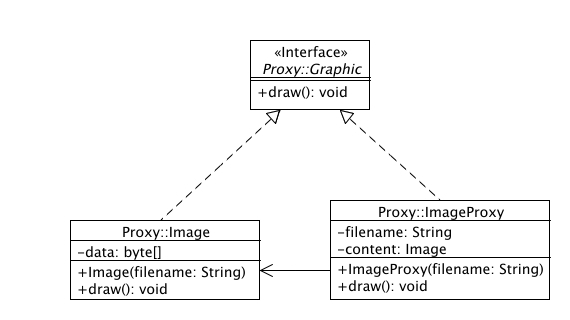 This proxy class may also be responsible for the creation of the Image object or it may also fulfill additional tasks like caching the extent of the image. //   if we haven't done it until yet. // Forward to the Concrete image.